I posted about yesterday morning already but not about the afternoon, so here we go — the condensed version, I hope … and you hope too, no doubt. Tofino is on the northern edge of the Pacific Rim National Park which is part of the UNESCO Clayoquot Sound World Heritage site. Phew! I hope I got all that more or less right. So, we headed back into the park this afternoon. I say back because we did have to drive through it to get to Tofino yesterday. What we saw was the Pacific Ocean. I mean the beginning of the whole big thing. We’ve been seeing bays and inlets and such ever since we got to the west coast, but not until today were we able to look out and see all of the way across to Japan (ha ha). The day was cloudy at best and rainy at worst, but I Photoshopped the first photo and brightened it up a bit. It’s part of Long Beach (yes, I know there’s another more famous one about a thousand miles to the south), which is quite long indeed. In fact, all of the photos (except the flower one) are of one part of this Long Beach or another. The next two photos are a little truer to what it actually looked like to us. I didn’t mind the cloudiness too much. It does have a certain atmosphere, and it is pretty darn typical. Guess who that solitary figure is in the second picture. We kept driving to the village at the southern end of the park — Ucluelet (as in You-Clue-Let). It’s much the same size as Tofino but less touristy, which is not to say that it isn’t at all touristy. 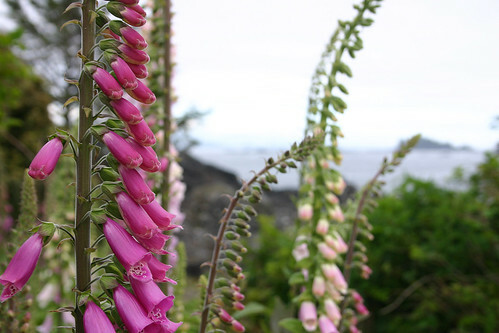 We walked around a bit, and for the umpteenth time in BC I saw splendid Foxgloves, so I took this picture with them in the foreground and the ocean in the background. Finally, on the drive back to Tofino, we made one more stop at Long Beach and took this photo from a lookout point. It was completely overcast and also raining by this time. We enjoyed the day and are now uncertain what to do tomorrow: stay here or head to Victoria and meet up with the A-Team there. I cannot stop raving about your photos, A/C. I’m taking a break from essay writing and they’ve been a wonderful distraction. I also saved a few to print later. They may end up on my wall. These photos are gorgeous, AC, your artistic eye is true. I love, just love, the moodiness of the ocean pics. I may try to paint one, if you don’t mind, and I’m working on one you took of the big trees. Couldn’t help it, my imagination rules. Looking at your photos I hunger to visit the coast again. Such beauty. Get thee to Victoria. Sup at her famed restaurant in The Empress Hotel. At the very least, pop in for high tea at 4:00. Do it. I’m so angry with myself for being so high on crystal meth when Donna and I were on the west coast. I missed so much beauty. Great pictures! and great stories. Again… wish I was there.